Submitted by Lioness on Wed, 2014-09-10 02:29. After a couple weeks of "phone tag" I got up with my mother. She talked a bit about being at the maternity home with me, even though she couldn't remember the name. Apparently her mother wrote either Ann Landers or Dear Abby for a recommendation as to where to send her. I may have made the paper before I was even born. Thanks Ann -- not! So after she got pregnant she and my father talked about getting married. She's Protestant and he's Catholic. They went to see the priest, who would only marry them if I was reared Catholic. My mother balked at that, and the wedding was off. Thanks Roman Catholic Church -- not! But she says my father knows about me and is a real nice guy, and offered to call him for me if I gave her his number, which I did. That's a relief off me. It felt good, until everything slotted into place. Submitted by Lioness on Sun, 2014-08-31 19:39. "Fracture reduction" is the fancy term for resetting a broken bone that's healed the wrong way. Somebody breaks a bone. They should lie up and have someone else take them immediately to the doctor, but that doesn't always happen. Maybe they can't get to the doctor, maybe there's no doctor around, maybe they have to use that broken bone anyway just to get by until they can find a doctor. Whatever. So when they finally get to the doctor's office, what happens? The doctors get out the bone saw and the knives and takes the broken bone back apart. They "break" it again into at least as many parts as the first time, if not more. They have to do this in order to set it properly. It's the only way they can ever hope to restore the limb to full functioning. But the pain is out of this world. The patient screams and struggles, fighting to escape from the excruciating suffering. Knowing it's the only way to regain the full use of their body does nothing to spare them from the agony they are going through. Submitted by Lioness on Mon, 2014-07-07 21:33. Usually things get easier to write about over time. Not this time. It's getting harder. My First Cousin (technically he's not, but he'll always be my Very First Cousin) was eager to help me. He's an elderly man in poor health, who needed the mental stimulation such a puzzle provided. He's been very encouraging, even as my moods have swung like a weather-vane in storm. I'm one of the least emotional people you'll ever meet, although I'm self-aware enough to realize that for me this symptom is a sign of an underlying problem. But here I was obsessively combing through genealogies and bursting into tears at every photograph. I desperately wanted to know who these people were, what their stories told about them, and how their stories related to my stories. I craved the stories grownups swapped while visiting and told to the kids on the porch during long afternoons. I cried the first time I spoke to First Cousin on the phone. It was the first time I'd heard the voice of a blood relation I hadn't given birth to. Submitted by Kerry and Niels on Thu, 2014-07-03 22:19. Earlier this year, the US Department of State published its annual statistics on inter-country adoption. Again a significant decline in the number of children adopted from abroad could be noted. The year 2012 had already been a low-water mark with 8668 inter-country adoptions. In 2013, the number went down even further, to 7094. The decline in inter-country adoption is not equally distributed, as can be seen in the following table. The Democratic Republic of the Congo, Uganda, Ghana and Nigeria have seen sharp increases in the number of adoptions, while traditional adoption countries such as South Korea and The Russian Federation have seen adoption drop to unprecedented low levels. The number of adoptions from South Korea haven't been this low since 1955. Is Adoptionland becoming less demonic? Submitted by Kerry and Niels on Thu, 2014-07-03 17:31. It has been less than three years ago that Pound Pup Legacy's Demons of Adoption Award was given to the Church of Jesus Christ of Latter-Day Saints for their dubious adoption practices. 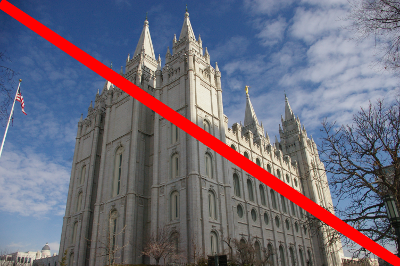 Over the years the church and its daughter organization LDS Family Services had been involved in various dubious adoptions, showing a lack of respect for the rights or unmarried parents. On top of that, LDS Family Services has been the least transparent adoption agency in the world. Unlike other adoption agencies, it is registered as a church and therefore it is not required to submit any financial information to the Internal Revenue Service. LDS Family Services resembled the type of hush-hush operation one would have expected during the 1950s and 1960s, an anachronistic organization out of touch with the societal make-up of the 21 century.